Jim Britton’s the kind of man who will tell you right off that he’s doing exactly what he’s always dreamed of doing — that’s mining for gold. And even if he’s not pulling gold at the level he’d really like to at a particular point in time, he’s quick to say, “I’d rather be here beside the river enjoying the looking and anticipating the discovery than living in the city and breathing all that pollution and just working at some regular job. “I was introduced to the Gold Bug at a very early age,” he says with a warm smile that turns quickly into a grin and makes one think that he may be about to spin a yarn. “Probably when I was six or seven years old. Back then, all us kids would watch adventure movies. I was hooked on the ones that had anything to do with gold. Then as I grew up I started reading about the old 49ers, and I just couldn’t seem to find out enough about where they mined and the methods they would use. Still it wasn’t till a few years later when I was out on my own with a shovel and a pan that I really got the ‘gold bite’. It was near a little town called Quartsville, just outside of Sweet Home, Oregon, where I actually found my first gold — about 1/2 pennyweight, and I’ve never been the same since. “I’ve always believed you’ve got to do your homework, and that includes a lot of research. And in those days I had just began to discover all about underwater dredging, and I figured that since panning for gold was giving me such a kick, I would pull more gold and have a lot more fun if I had a dredge. So I went out and bought myself a two-inch suction dredge, and within no time at all I was pulling two to three pennyweight a day and just having a great time. Jim has worked a lot of different areas of the Pacific Northwest, basically following up the different strikes of the old 49ers. He says he’s hit most of the hot spots in eastern and southern Oregon as well as spots in Idaho and California. Right now he’s mining the Klamath River in northern California, using a customized six-inch with a Keene power train and sluice box that is mounted on an R & R Mining frame and float bag kit. 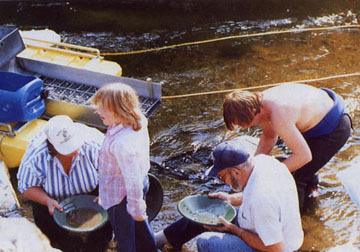 Everett Gene Britton, Jim’s father, who helped finance that first 5-inch dredge, remained an avid gold miner until his death early this spring, stating in no uncertain terms that some of his very best days were spent panning gold and tending dredge. In the local area surrounding the Klamath, Jim Britton is known as a man who will lend a helping hand. The kind of person who will take time out of his own diving schedule to get a neophyte gold miner off to a little better start. And he’s an advocate of “miners helping miners” and the necessity of miners working and standing together to protect their rights as granted under the 1872 Mining Law.